Providing meticulous services throughout Western Massachusetts since 1977 At Dennis E. Tully, Attorney at Law, attorney Dennis Tully is well known throughout Western Massachusetts for clearing up complex real estate title problems and issues, including those involving very old/historical documentation and filings. 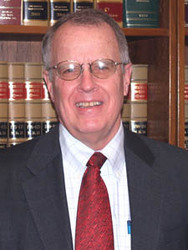 He is devoted to the exclusive practice of real estate and estate planning law. When you are facing the Massachusetts legal system, your interests are best protected by a competent and responsive attorney. Dennis has the skill to apply his refined knowledge and 35 years of experience to generate solid results. Real estate in Massachusetts Attorney Tully specializes in real estate closings representing both sellers and buyers, refinancing of existing mortgages, tax title properties, Quiet Title Actions in the Land Court and landlord/tenant issues. His extensive knowledge of property rights and business law puts him in a proactive position to resolve your real estate dispute, no matter how simple or complex. From start to finish, he and his capable staff clearly and precisely discuss their legal strategies with you and remain accessible throughout your case to answer any questions you may have. Our law firm is also experienced in all forms of alternative dispute resolution, such as arbitration, mediation and structured negotiations. Reliable support in estate planning Our estate planning services include the preparation of wills, health care proxies and durable powers of attorney, as well as the probating and administration of estates and related probate matters. Dennis has more than three decades of experience drafting and litigating estate plans and is often able to anticipate potential problems during the drafting stage. He can then devise plans to avoid those problems. Preserving your family's wealth for future generations Whether you're planning the parameters of your future medical care or establishing support for loved ones upon your death, attorney Dennis E. Tully can help with all aspects of trusts and estates issues, including: -Estate planning -Estate tax issues -Choosing the appropriate executor -Guardianships -Living wills -Living trusts -Wills drafting Securing your legacy You work hard for your family, so knowing that you have planned for their long-term well-being and financial security can bring you comfort. We thoroughly analyze your estate and strategize the best means of transferring your assets, minimizing taxes, establishing guardianship for your children, caring for your pets, supporting personal philanthropic causes and protecting your loved ones. Draft your living will and last will and testament A will is essential at every stage of your life. Your living will sets the parameters for medical intervention should you become incapacitated. This assures that when you are most vulnerable, your wishes will be honored. Your last will provides the opportunity to distribute your property, establish care for your children and otherwise express your wishes upon your death. A will is necessary if you intend to leave property to a person or entity other than a blood relative, such as a domestic partner, a friend or a charity. If you die without a will, the court determines how your property is distributed, who cares for your children and even what happens to your pet making decisions that might not reflect your desires. We can draft valid wills that ensure your intentions are honored. Changing your will As your life changes, so might your estate plan. You may need to update your will throughout your life. We draft valid codicils that address changes in your financial situation, marital status, number of children, philanthropic interests and general lifestyle decisions. Appointment of guardianship If you have minor children, your will allows you to make decisions about their future care. This is especially crucial if you are a single parent or if both parents die in a common incident. If you do not name a guardian, the court will appoint a guardian for your children and can make decisions adverse to your ultimate parenting goals. You can also make arrangements for your pets' care in your will, including naming a guardian to take responsibility for your pets. Experienced Massachusetts trust and estates attorney guiding you through the process Probate follows what is typically a painful emotional loss. Attorney Dennis E. Tully has 35 years of experience in probate law and knows how to ease the stress of probate by guiding executors and beneficiaries. The process of probate Most executors have rarely if ever probated a will and know little about the process. Dennis and his staff can guide you through the complex probate process, including: -Filing the will with the Massachusetts probate court -Developing the best strategy for fairly and expeditiously probating the estate -Finding and collecting assets -Closing and opening bank accounts -Transferring assets from the deceased to the estate -Paying estate taxes -Valuing, managing, preserving and liquidating the estate -Locating beneficiaries -Hiring experts, when appropriate Valuing and managing the estate We assist executors with the arduous process of collecting, managing, valuing, protecting and liquidating the assets of the estate. Dennis E. Tully, Attorney at Law has a team of experts available to assist in every aspect of estate probate. When appropriate, the firm calls upon accountants, financial advisers, real estate agents, property managers and other professionals to assist with executor duties. We can access expert opinions about unique assets such as antiques, rare books, automobiles and other collectables for accurate valuation, management and possible sale. Probate disputes Even in apparently straightforward estate cases, there are sometimes disputes between beneficiaries. Our attorney's professional courtroom presence can calm the emotionally-charged process of probating a challenged will or disputed executor or judicial decision. When it is in the best interests of our client to preserve cordial familial relationships, we are adept at mediating these disputes. When necessary, we assertively defend our client's beneficiary rights within the Massachusetts probate court. Experienced East Longmeadow real estate lawyer Attorney Dennis E. Tully applies his extensive knowledge about property rights, real estate issues, finance and business to all areas of real estate law. With more than 30 years of experience in real estate law, he and his staff can help you with: -Residential home sales transactions -Commercial property sales transactions -Homeowners associations -Condominium law -Landlord-tenant disputes -Evictions -Foreclosures -Real estate contracts -Eminent domain -Zoning, land use and building permits -Boundary and easement disputes -Title disputes Real estate transaction attorney From offer to sale, we handle all aspects of buying and selling real estate and construction, so that you can feel confident about a smooth and precise transaction. We can: -Draft or review your sales contract -Negotiate real estate agreements -Review your lending documents -Search and clear title -Analyze your deal and rectify potential problems -Handle land use, zoning and permitting -Conduct your real estate closing Real estate litigation attorney Real estate litigation requires substantial knowledge about property laws and civil litigation, as well as a dynamic courtroom presence. At Dennis E. Tully, Attorney at Law, we possess the specialized knowledge necessary to successfully litigate your real estate disputes. Real estate negotiator Some disputes are better solved outside of the courtroom. We guide negotiations to protect your interests. By retaining an experienced mediator to strategize during the contract negotiation process, you can often prevent disputes from arising at a later stage in the real estate transaction. This can save time, costs and frustrations. -Member of the Springfield Lodge #61 of the B.P.O.E.